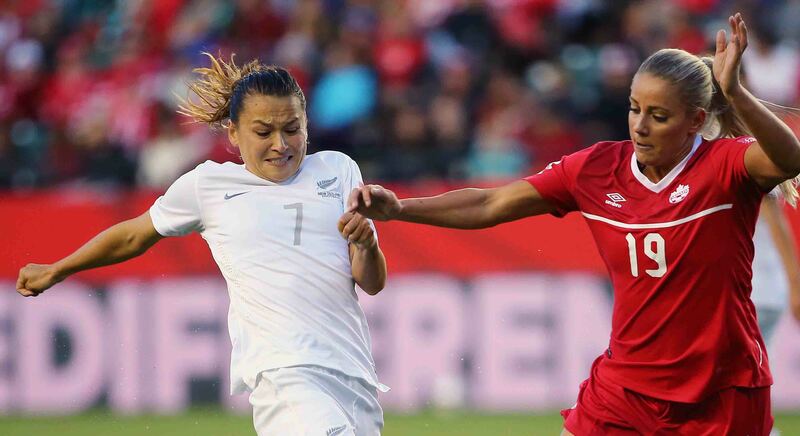 The 28-year-old American-born Kiwi is expected to make history tomorrow when the Football Ferns play the Australian Matildas in the first of two international friendlies to prepare for the Rio Olympics. The likeable defender will join some illustrious company in the Ferns’ 100 club. She will become only the fifth New Zealander to play 100 games or more for her country after Abby Erceg (124), Katie Duncan (nee Hoyle) (113), Amber Hearn (110) and Ria Percival (114). Riley, who plays her football for FC Rosengård in Sweden, doesn’t expect she will get too emotional when the teams line up for the anthems tomorrow afternoon at Morshead Park in Ballarat. “It is just another game,” she said after training. “Every game is a privilege and an honour for me. I can’t believe I get to do what I love both professionally and personally. Football Ferns coach Tony Readings said Riley is a key member of the team both on and off the pitch. “Ali Riley is the heart and soul of our team,” he said. “People can see what sort of player she is on the pitch because what she brings is obvious – she’s fearless, fit, works through the pain barrier, is really skilful going forward and has lots of pace. It is fitting that Riley’s 100th cap will come against the Matildas as her international career began against Australia in 2007. While Riley has special memories throughout her successful time with the Football Ferns over the past nine years, her debut is one that she would rather forget. The Ferns were comprehensively beaten 5-0 by Australia that day and she admits that her introduction to international football was a baptism of fire. “The good thing about this team is we have only got better and better,” she said with a laugh. “The first few caps, or first few tournaments even are not really my fondest memories. She has countless fond memories but the one highlight would be the 2012 Olympics which she described as “probably one of the greatest experiences of my life”. “We were still such a young team in 2007 and 2008 but in 2012 I felt like we really made a statement,” she said. The Ferns made the quarterfinals at the London Olympics – losing to the eventual champions the United States – and it was a really proud moment for Riley and the team. First things first and the Ferns are focused on taking on the old foe on their home turf. Riley reckoned they could not have asked for a better opposition in the lead up to Rio. She said in terms of their skill and their style, the World No 5 is a good comparison to the USA and France. Riley was the last member to join the Ferns squad in Victoria but she said the preparation has been good and the team is looking “really snappy”. The Ferns have been revising all of the things they worked on for their last fixture against the Netherlands that didn’t go to plan in the 2-0 loss. For all the reflection on her career so far, Riley feels like there is much more to come. She is excited about what this team can achieve at the upcoming Olympics.